Romero tells the story of the civil war that wracked the country of El Salvador three decades ago, and of the mild-mannered Catholic Archbishop Oscar Romero who grudgingly entered the conflict on the side of the poor. Romero evolved into one of the most visible and outspoken critics of the outrages committed during the Cold-War conflict and gave consistent voice to the principle of nonviolence. For his activism, Archbishop Romero would pay with his life. This movie does not pull punches in the images of violence that it presents. This is righteous anger from the director, who wanted to wake people up with something hard, not fuzzy. You will find this hard to believe, but the movie stops just as the war begins. In other words, you ain’t seen nothing yet. Some attending the funeral of Romero are shot for doing so by government soldiers, some circling above in a helicopter and firing down on the public. A guerrilla group is formed from many parties – some Marxist — in the following year. It was called the FMLN for the Faribundo Mart National Liberation Front. They launch a civil war against the government, and the government earns the backing of the U.S. in the name of fighting the Cold War. The U.S. will vastly increase its military aid and training to El Salvador, totaling an average of $1.5 million dollars per day for the next 12 years. The death toll is between 60,000 and 75,000 killed over the war, varied depending on when you start the war and the death count. This is in a country of 6 million. So the share of dead to the total population would equal, if this were to happen to the U.S., would be as if the U.S. lost 3.25 million people. Think of this way, their loss would be as if the U.S. had suffered death on the scale of the 9-11-2001 attacks every three days since the day of those attacks. Oscar Romero was the Archbishop of El Salvador from 1977 until 1980. During the days Romero served as Archbishop, political and social problems arose throughout the world because of the Cold War. The effects the Cold War had on El Salvador are indescribable, also leading to their own Civil War. The most devastating effect of El Salvador’s Civil War was the death of close to 600,000 people. Other problems that El Salvador had faced, were struggles between rich and poor, communism and conflicts in the church. While looking at the conflicts in the church, some of the main questions asked were, What is the Church for? and What do we deliver to our parishioners. In order to work towards answering these questions the church made changes in order to reform and be made accessible to its parishioners. According to the Liberation Theology, the church works on behalf of social justice. Meaning there is no divider between church and state, all that matters is that justice is brought about in their country. This effort of justice is exemplified greatly in the works of Oscar Romero. In the beginning of Romero’s position of Archbishop he did not seem like much of a leader. He was said to be a “shy, bookworm” and never really stood up for his people. However, upon seeing the injustice and violations of human rights he began questioning many things. He questioned why innocent civilians were being killed daily and as the war progressed, the assassination of many high priests. Because of this curiosity he becomes driven in gaining justice and understanding his questions. By the end of his life, before being assassinated after giving his homily in mass, he became a great leader. In tying this film to material we learned about in class, I think of the lesson from 10/28. Although not directly connected we learned how there were problems with religion in Cuba. The Santeria religion is an Afro-latino religion. During the slave-trade, more African Slaves went to Cuba than anywhere else. The Catholic Religion was forced upon them and they used that as a disguise for their own beliefs in Santeria. For Example, they disguised their “Orishas” as saints, i.e. the saint of fatherhood is Saint Christopher, the Orisha of fatherhood is Agayu. 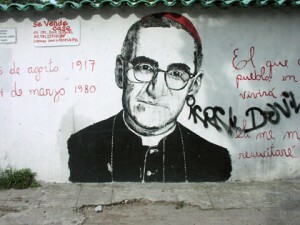 Oscar Romero became the archbishop of El Salvador in 1977 after Louis Chavez. Romero being elected was a surprise and many were unsure if he was the right man for the job. During that time, El Salvador, along with many other countries, had many political and social problems due to the cold war. El Salvador now faced many problems. A civil war broke out, leaving over 60,000 people dead in the end. During the early stages of this madness, people turned to the church for help. Many people did not think that Oscar Romero was right the right man to be archbishop and at the beginning of the movie it seemed as if should not have been elected because he was laid back and didn’t speak his mind. During the movie, Oscar Romero showed a lot of change in his attitude and feelings about what was going on in El Salvador. At the beginning of the movie, Romero seemed to keep to himself and not express his feelings. But as murders of citizens and other priests became more persistent in El Salvador, Oscar decided that something had to be done. I believe that Romero’s biggest change came with the death of his good friend Rutilio Grande, another priest that had dedicated his life to social justice. His death his Romero pretty hard and this is when Romero started expressing his feelings. Innocent people were dying in his country and for the rest of his short life, Romero dedicated it to bringing social justice to El Salvador. Oscar Romero was killed on March 24, 1980. He was killed while giving mass. The work he did will never be forgotten and even though there were worse things to come after his death, the impact he had on his country will last forever. The story of Romero is a very tragic one. It is filled with violence and murders. Dr. Kreitlow introduced the film before it was shown. He explained the major conflicts in El Salvador at that time. The article Dr. Kreitlow posted also speaks of the conflicts which include poverty and overpopulation. There was the same number of people in El Salvador as in Nicaragua but only one sixth of the space for them to inhabit. This fact in itself would help explain why such problems arose. Not only was space an issue, but the separation of the classes became a problem. Nearly sixty percent of the land was owned by only two percent of the population. Of the 4 million acres, this would mean that two percent of the population owned 2.4 million acres. Because of the civil war, a civilian-military junta was created and took the place of the government. They tried many things to help out their people. They nationalized the banking system and the sale of coffee. Also, they issued a land reform, Decree 153, which stated that any estate exceeding 1,250 acres would be run by the workers themselves in hopes that the land would be more evenly spread throughout the classes. In the movie Romero, the major hardships are very present. Romero was present through it all. The biggest change that I noticed in Romero himself was that in the beginning he seemed like he was a little confused at what he needed to do, maybe even a like he was not sure what his stance should be as a priest. It seemed, too, that he wanted to stay out of all the violence and settle things peacefully. By the end of the movie he was definitely more vocal with what he wanted done. He was not afraid to stick up for himself and his people. He was still opposed to violence, but he was forced to act violently due to the vicious attacks by the enemy. The idea of communism is all over in the movie. One major indication of communism is the violence. They are trying to force everyone to give in to the commands of the government or leaders. The FMLN was using violence to fight back. They weren’t using it so much to scare their opponents, but rather to fight against them. The military government was using violence to force the enemy to obey their commands. The major difference is that the military governments was using violence anywhere they thought they were being threatened and the FMLN was trying to stay away from violence and be the freedom fighters. Romero, in the end, died for his people. He was fighting for them and ended up getting assassinated in a church. It was a very sad end to a very sad story. Overall, I think that this movie was a great way to show what really happened and the struggles that El Salvadorans faced. Oscar Romero was the archbishop of El Salvador from 1977- 1980. He entered the conflict siding with the poor. Romero was one of the most outspoken critics during the Cold War conflict. When Oscar Romero was appointed to be the archbishop some people were skeptical of how he was going to lead the church. Once he was appointed the people of El Salvador greeted Romero with many gifts for him and his home. Many women with small children even said that they wanted him to baptize their child. Romero said it would be his privilege to do whatever the people of his church had asked. Romero tried to bring peace and understanding to the Catholic Church in El Salvador, but the government was trying to over throw him. All Romero was trying to do was to bring the Word of God to the people he was serving and the government did not like this. Romero just wanted the people to be safe and be able to express their religious views in the church. The government did not even let its own people vote. One simple right and the people were being punished. They had to walk back to the city because the guerillas shot at the bus so they were not able to move forward on their journey. It was hard to watch the people of El Salvador being kidnapped and shot when they had done nothing wrong. It was very hard for Romero to sit and watch all of this go on either. So Romero tried to stop the government from torturing his own people, but innocent Romero was not so lucky because he was killed based on the way he wanted to see change. My question was: How could Romero still want to preach when all of El Salvador was under attack? I believe that he was determined to carry out his duty as the archbishop because that is what he was appointed to do. He also wanted to show the people of El Salvador that they could live for Eternal Salvation and should not be afraid. The movie on Oscar Romero really opened my eyes to see that other parts of the world have had very hard struggles on religion that in my mind is supposed to be a peaceful situation. The movie Romero was very emotional but referred a lot to what we have learned in class and through Pastor Rafael Rodriguez’s presentation. The Catholic Church in the movie became very controversial when Archbishop Romero along with other preachers started practicing liberation theology. Liberation theology according to Rafael Rodriguez and our discussions in class was an outcome of the Medillin Conference of 1968. The church felt that they needed to achieve liberation theology, which meant that they needed to change the people’s heart and not the structure. Many people began to believe that the church was over stepping its boundaries as we saw in the movie Romero. Many of the rich felt that things were fine the way they were and no changes needed to be made, but Romero saw how the poor were treated and felt the desire to take a stand for them and help them so the rich were not the only one’s benefiting. The rich felt that it was because of their wealth and gifts that make the church what it is and they should be treated as superiors. Because of this way of thinking approximately 60,000 people died for expressing their feelings by either just simply going to vote or attending mass. Why would Archbishop Romero continue practicing when he knew that he and his followers were in danger and likely to die? I believe that Romero felt that if he stopped fighting and supporting the poor his followers would no longer believe in him and what they were fighting for like the rich had felt that Romero had turned on them when he was simply trying to help the poor. He felt that this was what god had sent him to do and the power behind the rich was inappropriate. He even went to the extent to tell the president that he was lying. The paramilitary were killing and kidnapping people in fear of the spread of this liberation theology. Romero tried up until his last moment to change people’s way of thinking and this brought him to his death in 1980 when he was assassinated during mass. He did not agree with the politics and fought until the end, sadly after his death this fight went on until the end of liberation theology with John Pope II. After seeing the movie “Romero” two or three times, I still have a few questions I have not been able to figure out. First, I wonder, why are the conservatives so upset? It seems like they are not really being affected, besides the lady who loses her husband. Their money is still getting them priveleges, so I don’t understand why they are so upset. I also wonder why the corrupt military didn’t use Romero to their advantage. Why did they think it was better to kill lots of people instead of trying to “side” with Romero? Since Romero had so much power throughout the country, why didn’t the military at least pretend to make agreements with Romero? Although it would have been just as corrupt, perhaps more lives would have been spared that way.